If you’re like most women, mealtime is likely less a source of renewal and more a source of stress or treated like another task on the to-do list. In fact, it might be the most utilitarian, routine things we do in our lives–we eat. It’s rare to have a memorable eating experience without making a conscious effort to understand how you can make meals special for yourself. One of things I’ve become more aware of, especially since becoming a mother, is how much control I actually have in setting my desired ambience for a meal. The Montessori education, for example, offers a helpful philosophy in this area: the key is to prepare the environment for the type of feelings and behavior you want to evoke (instead of controlling people or situations). The simplest way I’ve found to create a special atmosphere for my meals is by using cloth napkins. Cloth napkins send a signal, both to yourself and others at the table, that eating food is to be cherished. They immediately make me feel like mealtime is time to be enjoyed. When I use cloth napkins, I feel grounded, present, and nurtured. Growing up, my mother used cloth napkins and my grandmother used cloth napkins. I continued the tradition when I started living on my own, even in college! The majority of happy memories I have of shared meals included cloth napkins. I’ve found that one good thing will often lead to another. 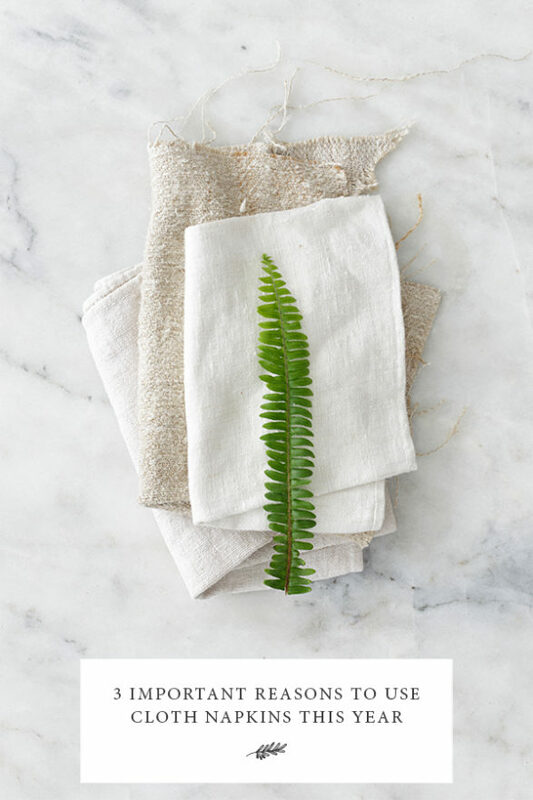 Perhaps using cloth napkins will lead you to take other steps to improve your atmosphere, such as getting fresh flowers, lighting candles, or having bowls of fresh herbs nearby. You have the capability to turn everyday into something special by setting an ambience for every meal with cloth napkins! Your turn: Do you use cloth napkins?